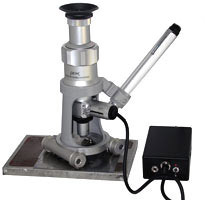 Peak Wide Stand Microscope is a simple measuring microscope designed to be compact and light weight like the Stand Microscope, but characterized by a wider field of view than the conventional ones. It allows not only to provide magnified view of fine pattern and contour of object, but also to measure length and compare the dimensions by using a scale built-in the eye-piece. 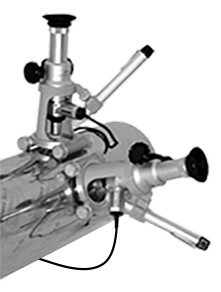 The standard 2034 series has always been equipped with sliding helical mechanism for the focusing while in the 2054 series the focusing is made through rack movement controlled by two knobs on the sides of the microscope. The 2054 EIM series is provided also with an optic system which allows the erect vision of an image. The 2034/2054 CIL series differs from the 2034/2054 series because it is also equipped with an coaxial incident light illumination. The illumination comes dwon from the inside of the microscope. This illumination system is suitable for observing the objects which have high rate of reflection. This particular type of illumination allows to inspect also irregular surfaces (small holes, cracks, notches) without shadows and then the vision is sharp and detailed. When you use the coaxial incident illumination, pull the change knob toward you and set it at the position "IN" and turn on the outer power source switch. When you use the pen light illumination, pull the change knob and set it at the position "OUT" and cut the outer power source switch. The illumination by pen light is available by turning on the pen light switch. Examining a curved surface with the traditional portable microscopes is often difficult; observing the surfaces and even measuring could be unreliable because of the instability due to the conformation of these microscopes stand, which is not suitable to be set on curved surfaces. Now the Roll series can be placed also on these surfaces (for instance, cylinders and engraved rolls for the printing sector, etc.) and make accurate inspections and measurements also with high magnifications. Several persons will be able to see and comment the same observation point because the instrument is firmly positioned. The fast and reliable positioning is guaranteed by a particular stand which allows the microscope to inspect rolls up to a minimum 80mm diameter; while it is available the Rolls Plus (optional) for rolls below 80mm and up to 10mm. In order to allow the observer an optimal vision of the examined surface and carry on them the beam of light coming from the light pen, the stand is revolving. 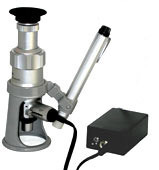 The Roll series also includes the version with magnetic stand M-Roll which allows, where possible, the microscope to be positioned also at 90° without bringing the magnets into direct contact with the surfaces. The whole range of the optical microscopes of the ROLL and M-ROLL series is available in video colour and B&W version and use interchangeable objectives with magnetic connection for magnifications from 15x and 1150x (with CIL COAXIAL until 2800x). For particular requirements (especially in the sector of general engraving) the CIL ROLL series is now available which, besides having all the features of the previous series, has the prerogative to be also equipped with a system of coaxial light. All these small and cheap videomicroscopes, have been designed with the intention of facilitating the user in bringing and using them. 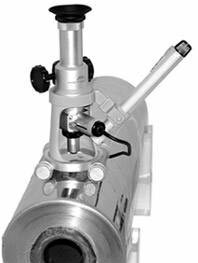 For those who have already Peak microscopes of the 2034 / 2054 series it is now available a specific Stand Roll which allows to integrate the microscope in order to allow the optical vision on curved surfaces. The "Roll" series can be also provided with magnetic rolls. The Peak Head Lupe is an extremely lightweight head-lupe and permits bright, wide and 3-Dimensional views by two angle lenses suitable for eyes. A person wearing glasses can use this lupe with their glasses on. This lupe is easily attached/detached by a magic-tape headband, allowing users to use both their hands freely. This lupe, equipped with a magnifying power of 2.2X, can be used for even more precise inspection by adding another pair of enclosed angle lenses which provide a magnifying power of 3.3X. It is possible to have variation from 4.1X to 5.2X, besides having 2.2X and 3.3X, moving in front of your eye a third mono-ocular lens already mounted on the Lupe. Superior functions of this loupe are best suited for such operations as professional precision processing. photoengraving, photography, and this lupe also serves in hobbies of model assembling, engraving and precision drawings. Use alcohol to clean lenses. Other chemicals will whiten the lenses because the lenses are made of resin. We have newly selected the models of 25X and 50X out of Peak Pocket Microscope series, in which we incorporated scales in their lens barrel, as shown in the picture. 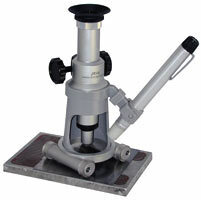 The Microscope can be focused in the same way as in our microscopes so far supplied. Observe an object by holding the unit with the notch of acrylic-cylinder point in front of you, with the centre of the lens placed about right over the specimen, tilting the cylinder towards forward and backward while applying an eye to the eye lens and setting the unit at an angle of catching the object clearly. Peak Lupe 30X has been an enjoying favourable reception from customers; it is a loupe of high magnification by the design of 4 elements, 2 groups, allowing erect image vision. This excellent magnifier is now fitted with a glass scale to meet the demands from the many different sectors. Thereby is possible to measure and compare the object to be inspected over the entire effective visual field of 7 mm. Insufficient supply of light has been improved by attaching to the Peak Scale Lupe 30X an illuminating device consisting of the penlight and the holder. Observations can be achieved more easily than ever. As 2037-L but with high intensity led lighting (6000K). It uses two 3,6V long life lithium batteries (AA type). Peak Lupe 4X uses a high-resolution achromatic lenses. With its wide square vision of 45x45 mm and a clever and smart design of its body, it will be useful not only in your daily life but also in various fields as an able assistant for precision works. Particularly, semi-transparent and black bottom skirts are provided which are very convenient for observation if you select anyone of them depending upon lighting conditions. For instance, you may use the semi­transparent skirt for checking photographic films, printed circuits and may install the black skirt for checking objects with diascopic light. In addition, for the focus adjustment of this loupe, a multi-groove screw helicoid system is adopted. The neck strap provided, will also increase operational efficiency several times.